SOUTH BEND, Ind. – Arike Ogunbowale scored 27 points and Jessica Shepard added 26 as No. 4 Notre Dame got its transition game going again in a 97-70 rout of No. 24 Florida State on Sunday. Ogunbowale, who had just 13 points on 4-of-15 shooting in Thursday's 72-65 loss at No. 25 Miami, moved closer to becoming the school's leading scorer. She has 2,301 points, with current Fighting Irish assistant Beth Morgan Cunningham ahead of her at 2,322. Skylar Diggers-Smith is the all-time leader at 2,357. 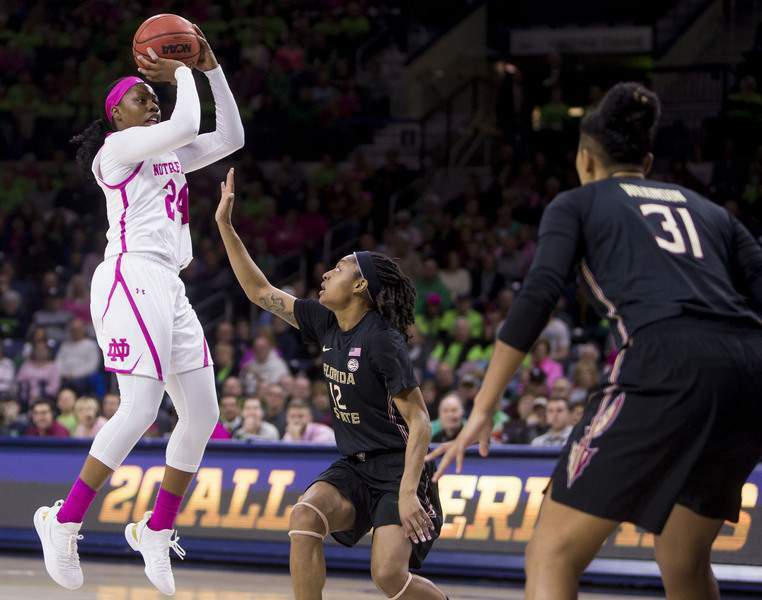 Shepard had 26 points on 12-of-22 shooting for Notre Dame (21-3, 9-2 Atlantic Coast Conference), which got 13 points and five blocks from Brianna Turner and 10 points from Jackie Young. Along with Ogunbowale's 9-of-16 effort, including 5-of-7 shooting from beyond the arc, Notre Dame shot 52.9 percent (36 of 68) after shooting a season-low 37.3 percent at Miami. Ogunbowale also had nine rebounds and five assists without a turnover. 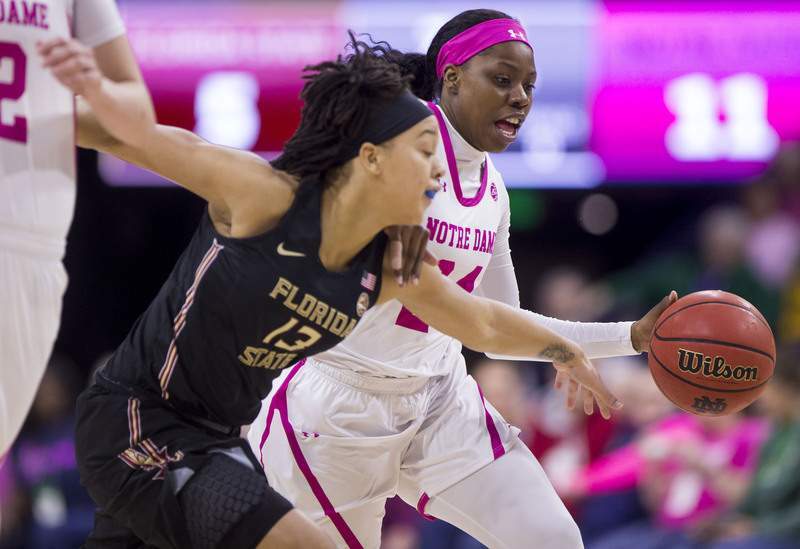 Nicki Ekhomu scored 26 points, Kiah Gillespie added 17 and Nausia Woolfolk had 15 before fouling out as the Seminoles (20-4, 8-3) lost for the first time on the road this season. The game was tied 2-2 before the Irish opened up a 22-12 first-quarter lead at 4:02 on a 3-pointer by Ogunbowale, who made her first four shots after going 20 of 61 in her previous four games. Notre Dame led 28-22 after a turnover-less first quarter. The Seminoles made just 5 of 15 shots in the second quarter and Notre Dame opened a 52-38 halftime lead with the help of a 9-0 run. Ogunbowale had 19 points and Shepard 16 for the Irish. Notre Dame used a 15-0 run to start the third quarter for a 67-40 lead with 3:34 to go as Florida State, after missing its first shot, missed its next 10 in a 6:00 scoring drought. It was 74-50 after three quarters. Florida State: The Seminoles came into the game with an ACC-leading plus-4.8 turnover margin but made 10 in the first half. It also didn't help that Florida State missed its first six shots of the second quarter. Notre Dame never trailed and had 16-point leads at several occasions in the first half. Notre Dame: The Fighting Irish, who were averaging almost 15 turnovers a game, made none in the first quarter and just four in the first half, the last two coming in the final minute. They finished with 10. The Irish's transition game, lacking in the loss at Miami, also got going and Notre Dame had 13 assists on its 20 first-half field goals, including 7 of 8 in the second quarter. Florida State plays at Clemson on Thursday. Notre Dame plays at Boston College on Wednesday.